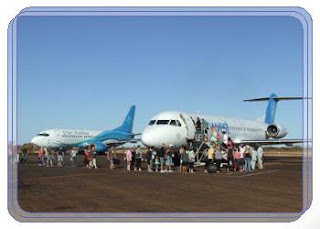 Forming the most essential method of transport between the town of Newman and the city of Perth, Newman airport (IATA: ZNE) is just over six miles south east of Newman itself, ensuring that air transport for local residents and tourists is a relatively simple process. Operated, owned and maintained by the Shire of East Pilbara, it offers fast travel to Perth in under two hours, with the typical flight time being 1 hour 45 minutes. While air traffic from the airport is undoubtedly dominated by the larger QantasLink and Virgin Australia jets, many light aircraft can be seen taking off and landing at Newman airport on a daily basis, with charter flights forming a huge part of the local environment. Port Hedland, Pilbara and other smaller towns are served by these light aircraft, providing an essential link for many who simply do not have access to a car to travel such long distances in. With so many passengers arriving into Newman airport from Perth, several car hire companies have taken up prime position in the airport terminal, offering visitors to the area some convenient transport. While many do decide to hire a car, it’s always a good idea to compare Newman airport car hire before making any decisions – and if you can do so before you set out on your journey you will undoubtedly save more money.